It was warm inside on Saturday at Gladesville, but outside the rain and wind meant winter had really arrived, so it was fantastic to see a crowd at Gladesville - and it was a great night. As a DJ I always worry that I will not please most of the crowd - I know there is always room for improvement, but it makes it all worthwhile when people let me know they liked it! 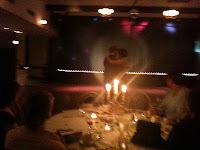 We had a birthday dance (pictured), a cake and alfajores - and lots of dancing. Then the next night we made our way through the cold and rain to The Victoria Room in Kings Cross where Fuego Blanco were playing. This band is a group of virtuosic young musicians from Sydney's Conservatorium and SYO, led by bandeonista Maggie Ferguson. I have been following them since they were first formed and they are now among the best - the Argentinian ambassador confided to me that he is very proud of them! They played 2 sets of tangos, vals and milongas brilliantly.